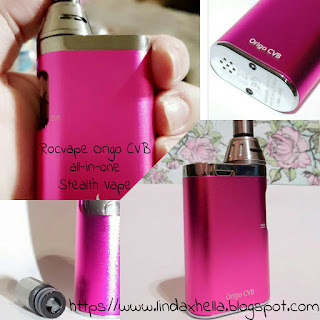 Lulu's Life: Rocvape Origo CVB review! 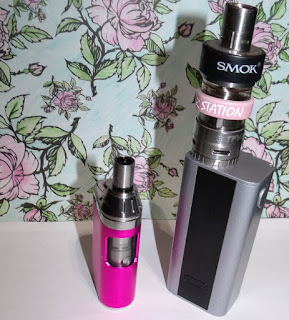 Recently I had the company Rocvape reach out to me asking if I wanted to review one of their new vape mods! I was honestly so shocked and honored they reached out. Vaping is something I'm passionate about. I’m big on promoting the switch from smoking cigarettes to vaping. Since I made the switch a little over two years ago, this is the best my asthma and breathing has been since I was a kid! I think everyone should know, with my reviews I will always be 100% honest and upfront. Just because I have something sent to me, doesn’t mean I’ll fake anything or lie about my feelings towards something. That being said, They did send me this for review, and I appreciate it so much! It’s total weight it only 80g. Leak proof built in glass tank. Built-in 1600 mAh Li-ion battery. Battery venting on the bottom. About the size of a Zippo lighter. Drip tip with no spit-back design. I received the pink Origo CVB on Saturday, March 4th. I've been testing it out since. I filled it up to the fill line and wicked up the coil with some Haze by The Cloud Junkies, which is 80/20 max vg. The coil wicked up super fast, that's what I love to see in a good coil, especially with Max vg juice. Upon first hitting it, I was so surprised at how much Vapor it puts out. I didn’t know what to expect when I got it, but I am so happy with it. Since it only goes to 18w and I’m use to 85w, I didn’t think it would put out as much Vapor as it does. I can use this little guy all day long on one battery charge and I only have to refill it once or twice. I do vape a lot, that’s something to keep in mind. If you’re a vapor who is only vaping occasionally, or even an all day Vapor, this is an awesome option for you. I noticed of I hold the hit in for a few seconds, it hardly puts out a cloud. Stealth vaping, for the win! I love that. Some restaurants do allow vaping, like buffalo wild wings. When I’ve vaped there with my big mod, people would complain just to be rude. But with this little mod, I’m sure I won’t have that problem again! Being female and all, I can actually slip this little guy in my bra without a problem or it falling out. My mod I have now is so heavy I can’t do that. Some women just like to throw things in their bra and go out and about. I am one of those women lol. Also, can we discuss the fact that it comes in Pink!? Thank you for that option! There are very few companies who have a pink color option. 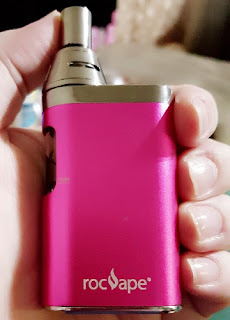 Over all, I love this little stealth vape! It comes in pink, its light weight, hits like a champ and puts off mini clouds. The battery life is great, it last almost all day. For having a built-in tank, it last surprisingly well. I have not had any leaking or spit back, and that’s something I encounter with every other vape I’ve used till now. My honest opinion is that everyone needs one. Next time I’m out and about I’m bring it everywhere with me! Shout out to Elliot at Rocvape for reaching out to me! Thank you so much for this opportunity, you’re awesome!